Netrino's engineers are recognized experts in their respective fields of electrical engineering, computer security, software design, and embedded systems development with impressive credentials. When they aren't providing litigation support to lawyers, their skills are applied to the work of embedded software development and real-time system design. Collectively, Netrino's engineers are the authors of over half a dozen books and more than 100 technical articles. 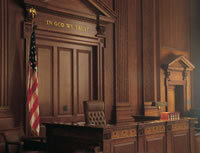 Netrino's testifying expert witnesses and litigation support consultants have been admitted in U.S. and Canadian courts. They are experienced with all aspects of patent prosecution and litigation, including being named inventors and making several appearances at the USPTO in patent reexaminations. Netrino's experts are also extremely adept at software and electronics reverse engineering and source code comparison in copyright and trade secrets litigation. "Netrino's work was critical to our success in a DMCA case with difficult proof issues." Netrino's founder, Michael Barr, has been admitted as a testifying expert witness in cases involving patent infringement, software source code copyright and trade secrets, DMCA, and software quality. As his expert witness resume shows he has testified more than twenty times. If you are trying to catch thousands of satellite TV pirates, it pays to have Netrino's embedded systems experts on your side for reverse engineering of electronics and software (read more).